The search for buried treasure lies, for most, in dreams and fantasy - requiring little to spark an interest which, for most people, rapidly fades. It is rare to find tangible and verifiable clues as to the existence of a treasure hoard. When treasure is found, it may have been pursued (for example, by metal detector), but is usually found by chance, and its location is more than likely random. This is not so with Oak Island. It is said that, in 1795, three young men discovered indications of a buried treasure on this island in Mahone Bay, Nova Scotia. In a clearing, they found an oak tree with a tackle-block overhanging a depression in the ground. This opened up into a shaft that later excavation revealed to be over one hundred and twenty feet deep with a supposed treasure platform which, with the treasure within reach, crashed into the depths. Over the last two hundred years, exploration on the island has revealed many mysterious markers and ground features - but no treasure. The quest for answers to the mystery has generated much speculation. Who was responsible, and what, and where are its origins? 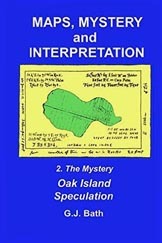 In this work, the author looks at some of the thinking that has been applied to the Oak Island mystery, and the possible implications of the discovery of treasure maps that, for a time, were believed to have applied to the island and its treasure.